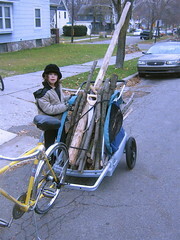 This was the day Shep and I went out together to cut wood with the bike trailer to bring it back in. You can see the little pruning saw we use to cut with. Just got a new saw in the mail which made in Japan called a Silky. It cuts on the pull stroke rather than the push like most all other hand saws. We go into the wild patches along side of the parks iin our neighborhood and cut wood from trees that have fallen. We still do not have a car so the bike and trailer is the way to get the wood back to the carriage house. Shep is a big help (his middle name is Ezra which means helper). When I get tired of sawing he steps in and takes over for a while.